I’m not really sure what compelled me to start a food blog. I seem to think I have endless amounts of time on my hands, and boundless energy to accomplish many things during the day. Blogs, you see, are living and breathing entities. You must feed the beast constantly for it to survive and grow, much like a tiny, little human; just like the tiny little human that consumes much of my time and energy. But enough of my complaining. What started out as an idea for lunch inspired by Food52, zucchini pancakes, quickly turned into a portfolio of work. After devouring the little stacks with the kid (baby approved! ), I thought to myself: what would be a *fun* dipping sauce for these other than the sour cream suggested? A quick search brought me to, you guessed it, Heidi’s blog where she instructs how to make the yoghurt cheese. It’s super simple: you just strain yogurt into a bowl for 24 – 48hrs. That’s it. Mix it with a little salt and lemon rind, and you are good to go. So that fixed my yoghurt and zucchini glut that had been taking up room in my refrigerator like unwelcome house guests. But what to do with the stacks of swiss chard I’m growing and not eating? If you can turn zucchini into pancakes, can you turn swiss chard into pancakes? Turns out you can. 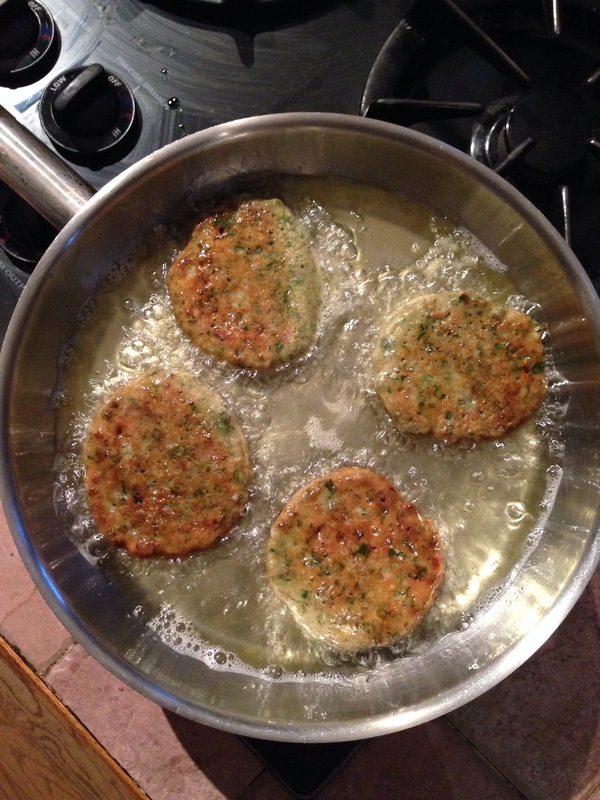 It’s a south of France thing called farçou, and it’s apparently a beloved fried street food. I mean, who doesn’t like fried anything? And it turns out those little farçou are also delicious with the labneh. Totally not traditional, but totally fantastic. To make a meal out of it, and to serve it as the French do, pair them with a salad. -I adapted Dori Greenspan’s recipe for farçou, which calls for 2 cups of milk. My first time making this I just dumped the milk into my food processor, *forgetting* about that little line on the side of the container that says “liquid limit”. The milk spewed out, but what I ended up with were thick, chewy pancakes. Happy accident. The second time around, because these have now become a staple for me and the kid, I dutifully followed Greenspan’s 2 cup rule, adding the milk in as I combined the ingredients with the food processor going, much as you would do if you were making pesto and adding in the oil. This resulted in thinner, crispy pancakes. Equally delicious. This is a toma-Toh / to-Ma-to thing. I prefer the thicker, chewyer kind. And I made these gluten free, but subbing in 1 – 1 oat flour for the wheat flour. If you don’t have more-than-you-can-handle swiss chard lying around, these would be tasty with whatever greens you can find: spinach, kale, collards, etc. And use whatever herbs you can find. Traditionally this calls for parsley and chives, but I didn’t have any, so I used oregano and thyme. I also feel that a tablespoon of dijon would be fantastic in the batter. And finally, farçou is apparently freezable in case you don’t eat all of them in one sitting. I have yet to master that sort of self-restraint. -For the labneh, Heidi’s recipe says to strain the yoghurt for 24hrs. The first time around, I ended up straining mine for 48hrs because I forgot about it in the fridge and ended up with a wonderfully thick cheese that didn’t separate. The second time around I was a better student and only strained it for 24hrs. It was still thick and creamy, but I noticed it separated a bit the longer it was stored in the fridge. Totally didn’t affect the taste, but I think I’ll be straining mine for 2 days instead of 1 going forward. I call for a whole lemon’s rind because my motto on flavour is ‘Go Big or Go Home’, but if that’s too pungent for you, just use half a lemon. -As for those zucchini pancakes that started this whole journey, I wouldn’t change a thing about the recipe except that it Must be doubled. Or tripled. Because they are f***ing great. I did omit the lemon from the original recipe and added it to the labneh instead. 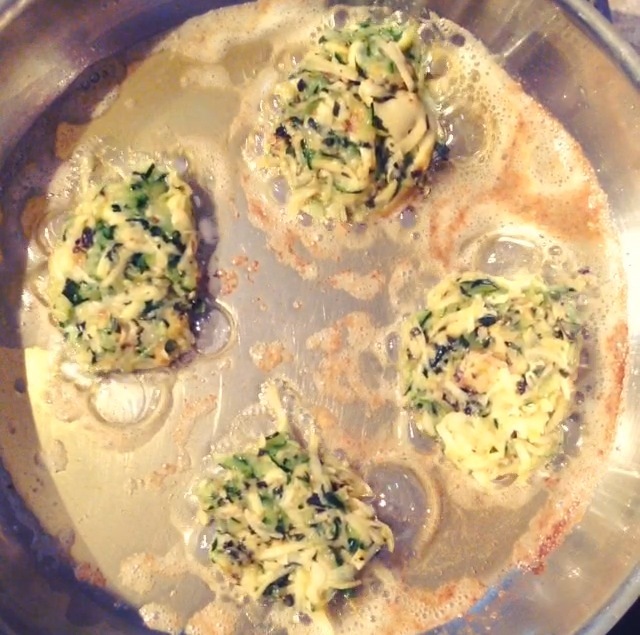 A pinch or three of cayenne would also be fantastic in these if you’re not serving them to 10mo old babies like me…..
-Grate the zucchini & potato into a colander, mix with a couple pinches of salt, and allow to drain for at least 30min. Releasing as much moisture as you can will result in crispier pancakes. -Beat eggs with the herbs, some salt, and pepper. -Transfer zucchini & potato to a dish cloth, roll it up, and squeeze out as much moisture as you can. Add them to the eggs and herbs; add the breadcrumbs. Stir everything to combine. -Heat oil in a pan over med-high. -Form pancakes by the spoonful, drop into the pan and cook until golden brown on each side. Transfer to a baking sheet and place in the oven to keep war,. -I can’t remember how many this made because the kid & I ate them before I could count them…… sorry……. -1c plain yoghurt. I used low-fat, but full-fat would probably be amazing. 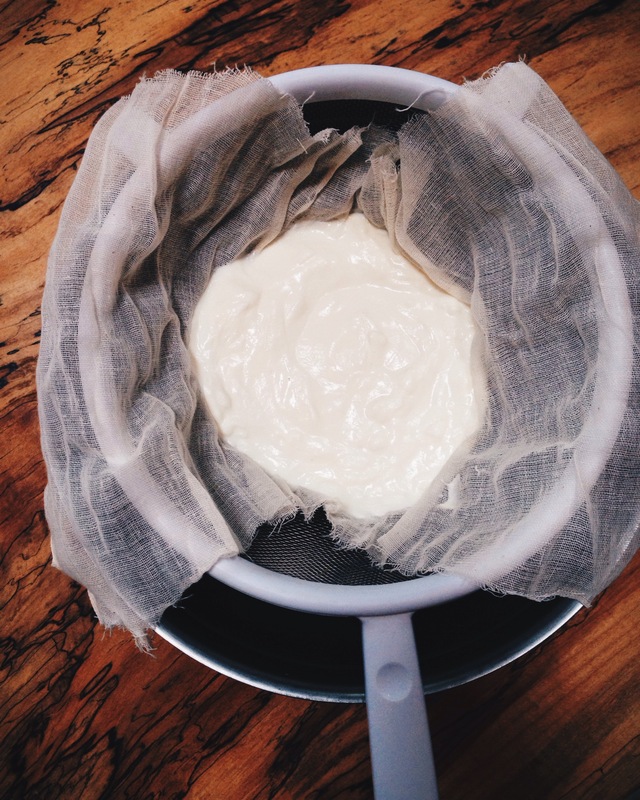 -Line a fine-mesh strainer with cheesecloth, set atop a larger bowl to catch the whey. -In a separate bowl, stir the salt into the yoghurt, and transfer to the cheesecloth lined strainer. Place in the fridge for 24 – 48hrs. -Stir in the lemon rind, and proceed to slather everything you eat with this stuff. -Makes about 1c, but the recipe easily doubles. -Preheat the oven to 250F. Line a baking sheet with aluminum foil, and line a plate with paper towel. -Put all ingredients except the milk and swiss chard into a food processor. Turn the processor on and pour the milk in to combine. -Add the chard and process to combine. Don’t over process though, it’s nice to see flecks of green throughout the soup-y batter. -Over med-high heat, pour 1/4″ to 1/2″ oil into a large fry pan. -When the oil is hot, pour 1/4c batter into the fry pan for each pancake. Depending on how large your skillet is, you can get 3 to 4 pancakes in. Don’t overcrowd the skillet or else they won’t fry up nicely. Cook the pancakes until the underside is nicely browned, about 3 – 4min. Flip, and cook until golden brown. Transfer to the paper towel lined plate to drain, then transfer to the aluminum foil lined baking sheet to stay warm in the oven while you make the rest of the farçou. Add more oil to the pan as needed. -To store, I wrapped them individually in parchment paper and placed them in an air-tight container, refrigerated.